This weekend while observing physicians learning a new technique, I was asked about stimulating interest and accelerating adoption. This isTHE challenge for makers of new products, especially in life sciences. After years of work and significant investment, when the time arrives that a company can finally move into the commercialization stage, the foremost thought is how to make everything happen faster. In my experience, sustained acceleration follows a slow steady start. Taking the approach of learning to walk before you run will reduce the severity of a fall from the inevitable stumble. When I say a slow steady start I am referring to really understanding your customer from their perspective when it comes to buying your product. The very best way to do that is to conduct research to draw out what they think, what they will respond to and how they will react when you put your offer in front of them. It seems so straightforward, and surely after having spent extensive time developing your product working with a ‘few good advisors’ the customers reactions should be predictable. However, frequently they are not predictable, and without a sound understanding of their thinking, you will be challenged to get the reaction you desire. Behavioral research continues to uncover the triggers behind the choices we make. A favorite author of mine Malcolm Gladwell detailed fascinating examples of how we make decisions in his book Blink: The power of thinking without thinking. Apparently we make decisions in the blink of an eye, or in real time terms, under two seconds! Two seconds is not much time to convince a customer to buy a new product, adopt a new approach or change behavior. To get a customer to do those three things, knowing their thinking beforehand is critical. Mind-reading is truly a gift of very few. Thus, simple clean research of the target customer is the best way I know of understanding their thinking. Roger Sperry, a neuropsychologist/neurobiologist initiated a study of the relationship of the brain’s hemispheres for which he and scientists Hubel and Wiesel were awarded the Nobel Price in Medicine in 1981. Sperry et al, found that the left half of the brain tends to process information in an analytical, rational, logical way. The right half of the brain tends to recognize relationships, integrate and synthesize information and arrive at intuitive insights. 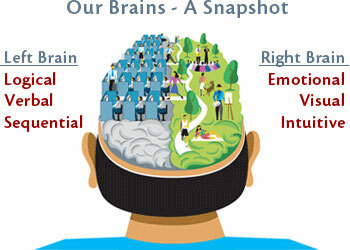 These differences are frequently described as the left-brain is logical and the right brain is emotional. The brain doesn’t have a ‘buy button, rather it draws on several different processes when considering a purchase decision. Emotional response is recognized as a strong influence over making purchase decisions – in that two-second space. In the case of accelerated growth it pays to understand the thinking of the target customer such that companies can present their offer in a way that compels the customer forward. In a post by Sam McNerney, who blogs for Scientific American on cognitive psychology, he provides examples of written, verbal and visual cues that drive desired behavior (Especially compelling, the ‘fly in the urinal’ example!). Really learning what the customer thinks before pushing forward with the heavy lifting of sales activities is a step that shouldn’t be skipped if fast forward is the goal. (C) 2012 pH Consulting. All rights reserved.